Summary: Thursday Next’s adventure continues in the seventh book in the series set in an alternate history version of the UK where literature is taken very seriously. 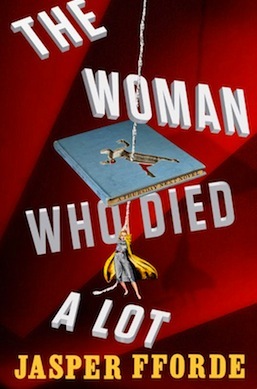 Following her escapade in One of Our Thursdays is Missing, Thursday is injured and unable to travel into the fictional BookWorld and instead takes a job offer to run the Swindon Library where books are protected with lethal force. Featuring God, time travel and synthetic doppelgangers, this is the strangest Thursday Next yet. If you have yet to read any books in the Thursday Next series, then I highly recommend you start. The franchise takes place in an alternate history version of the world (specifically England) where literature is so well-loved that there is a special police division to protect it, political groups centered around famous authors and if you were to enter the original manuscript of a novel you could change the events within them. Did I mention there’s time travel and extinct animals have been re-engineered as pets? Well there’s all that too. This newest incarnation of the series, which features an older Thursday with grown children (Tuesday, Friday and the imaginary Jenny who is really just a mind-worm implanted in Thursday by her nemesis Aornis Hades) is the most confusing and inventive book so far. Bear with me while I explain the plot, because it’s a whole lotta plot. The first plot point that the series revolves around is the existence of God, who decided to make His presence known by smiting entire cities, turning people into pillars of salt and basically reverting to His Old Testament ways. No joke. In this instance, His ire is pointed toward Swindon where Joffy Next (Thursday’s brother) created the unified religion known as the Church of the Global Standard Deity, which didn’t make the guy upstairs very happy. Previously, in order to deal with the Stupidity Surplus, which is also a real thing, the government spent tons of money on an Anti-Smite shield, which was being built by Thursday’s genius daughter Tuesday, but when God turned out to be real the surplus needed to be dealt with in other ways, so Swindon reinstated the Spec-Ops division to waste a whole lot of money on an organization they recently disbanded. As a result, Thursday is offered the job as the head librarian of the Swindon All-You-Can-Eat-at-Fatso’s Drink Not Included Library Service. Books within are protected by the SLS (Special Library Service) who wear combat fatigues decorated in book spines to better blend in with their surroundings. In the previous books, time travel was a thing, but that’s been completely done away with. Sort of. As it’s explained by the narrator, a member of the time-traveling Chronoguard went forward until the end of time and realized time travel had never been invented. Since the time-travel technology the world was using worked on the premise that at some point the technology would be invented, the division was disbanded. You’re already confused, aren’t you? Citizens who were going to be Chronoguards received Letters of Destiny which told them about the future that could have been and the future that will be instead and those who had already served their time were given new pasts that only they have the memories of. Which doesn’t work out so well for their family members. This is particularly stressful for Thursday’s son Friday who was set to save the world on multiple occasions and whose new future includes him murdering one of his sister’s classmates and spending the majority of his life in prison. It’s slightly better for Thursday’s father who remembers anecdotes from his children’s childhoods that never happened. Just in case that wasn’t enough for you, while all this is happening an asteroid may or may not hit Earth and destroy all life on it in 2041. And that’s all without going into the devious plot devised by the thorn in Thursday’s side, the Goliath Corporation and their duplicate Thursdays. I warned you there was a lot of plot. Thankfully in the hands of Jasper Fforde, all these different threads manage to interweave in a beautiful timey-wimey ball. With each Thursday Next book I read I can’t imagine that Fforde could possibly flesh his world out any further but he always does. For example, in order to determine the sanity levels of government officials they are given a specific NUT level and before the time engines were shut off TJ-Maxx was a time-loop prison (Temporal-J Maximum Xecurity) where prisoners are trapped in a never-ending time loop. For example, a prisoner could be trapped in a time loop in which their girlfriend repeatedly tries on the same tank top for all time. Which really is the worst punishment I can imagine. We also learn a little bit about other dimensions, which didn’t break any fourth walls, making me a sad panda. Thursday Next’s world is ID-11, which is the only dimension with David Hasselhoff, diphtheria, bicycles, dogs, music and the French. It’s the job of Spec-Ops division three to trade with other dimensions, which is why we have fax machines, escalators and the food chain Aldi. Ever wonder why the brands in Aldi make absolutely no sense and you’ve never heard of them? No worries, it’s just because they’re from another dimension. Unfortunately the one thing this book was missing was the BookWorld. In the series, Thursday can jump to the BookWorld and enter the fictional world of books, interact with their characters and just basically give me everything my literary heart desires. Thankfully, the Next book (yuk yuk yuk) will feature Dark Reading Matter, the empty part of BookWorld which is theorized to contain long lost books and creations from the oral tradition which never made it to print. The hypothesis is that this unexplored area is somehow related to Imaginary Friends (which aren’t so imaginary) and wander the planet until their “host” dies and they are sent to the Dark Reading Matter. Eeep, I want to read about that now!!! Author Jasper Fforde’s other books are equally inventive, including the dragon filled/magic real world of The Last Dragonslayer, the Thursday Next spin-off the Nursery Crime series and the Shades of Grey novels, which are based around a Colortocracy, a world in which what colors you can see determine your social standing. They’re all amazing, so get reading! I won’t ask nicely a second time.